Prepping individual servings for the freezer. Earlier this month we celebrated Italian Fest Week at my house. With the assistance of my mom and niece, I prepared both my lasagna and manicotti recipes with the express intention of keeping individual portions stored in the freezer. This time of year, when life seems to hit the fast forward button from Halloween through New Year's Eve, I appreciate having homemade meals at the ready that can be heated directly from the freezer. I also really appreciate that lasagna and manicotti fall under the category of stress free entertaining. 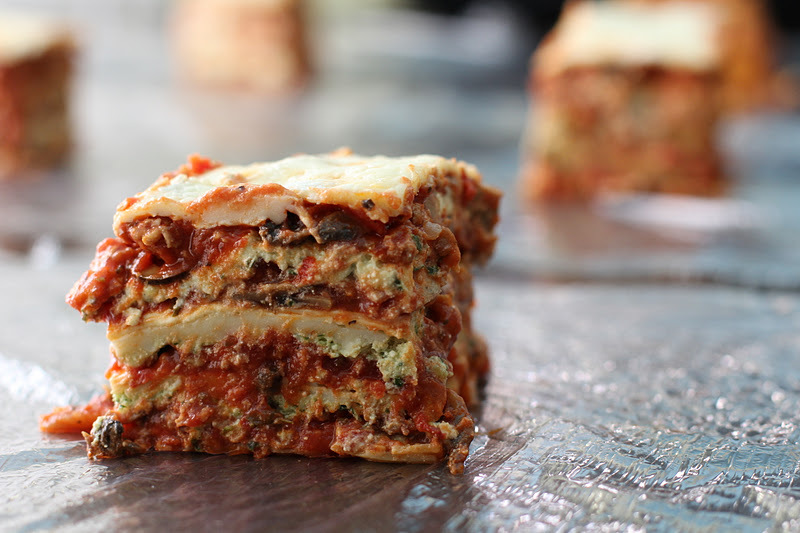 The lasagna receives a two-fold flavor boost by substituting chicken sausage for ground beef, and by adding homemade basil pesto to the ricotta filling. 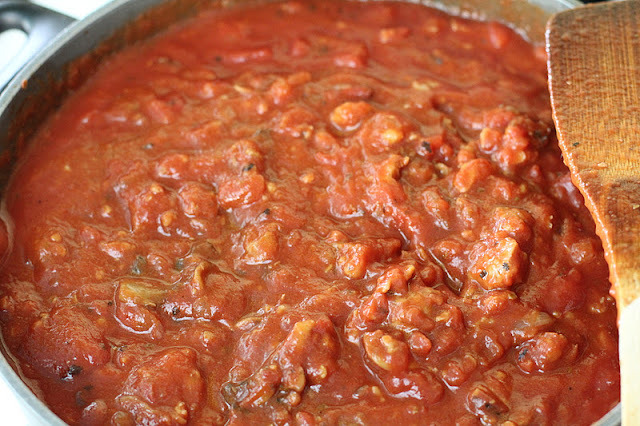 I also like letting the meat sauce rest in the refrigerator for a day for the flavors to fully develop. I assemble the casserole in a roasting pan large enough to cook a 24-pound turkey, which is large enough to yield 25-30 portions, depending upon the size of the squares that you cut. 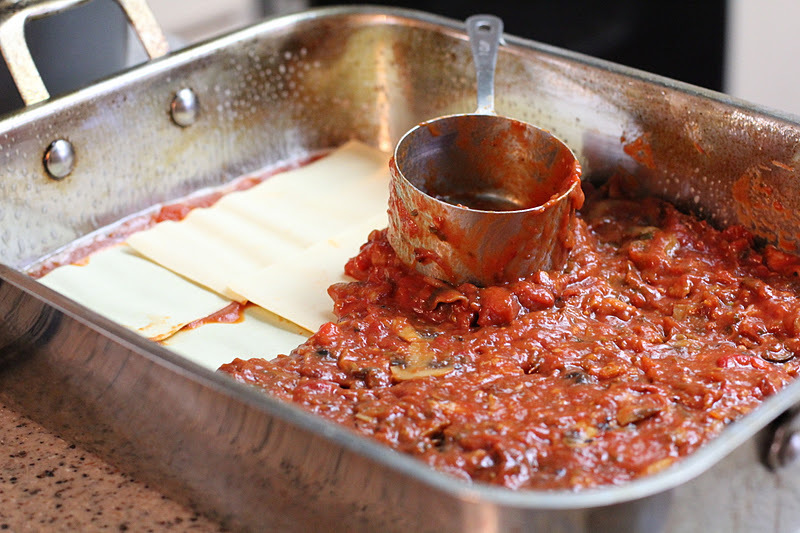 To make a smaller lasagna, you can halve the portions, or simply freeze half the meat sauce. For a complete meal, serve the lasagna with a green salad and homemade garlic bread. Following are a few of my favorite lettuce salads: Rockin' French Salad, Salad of Leafy Greens with Joan's Vinaigrette, and Caesar With and Without the Egg. I like roasting bell peppers in the oven. 1. Preheat oven to 350°F. Place the bell peppers in a glass baking tray or on a cookie sheet. Drizzle the peppers with olive oil, and rub the peppers to coat the peppers evenly. Put the peppers in the oven and bake for one hour. Turn the peppers at least once for even roasting. 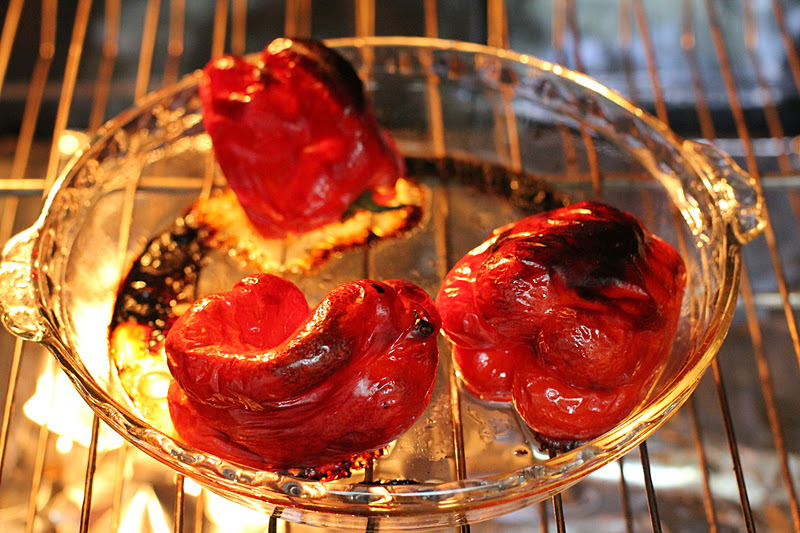 Remove the blackened peppers from the oven; cool to room temperature. Remove and discard the skins and seeds. Cut the peppers into strips. The peppers can be prepared up to one day ahead and refrigerated until ready to use. 2. 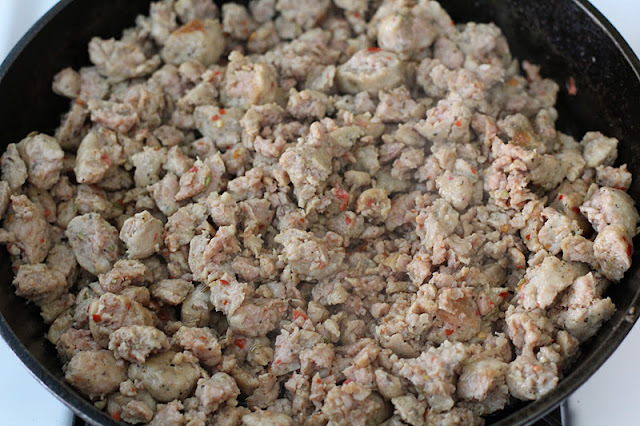 Into a large pre-heated skillet, squeeze the sausage from the casings and crumble with a spatula. Stir occasionally until the sausage is browned, and cooked bits begin sticking to the skillet about 20 to 25 minutes. 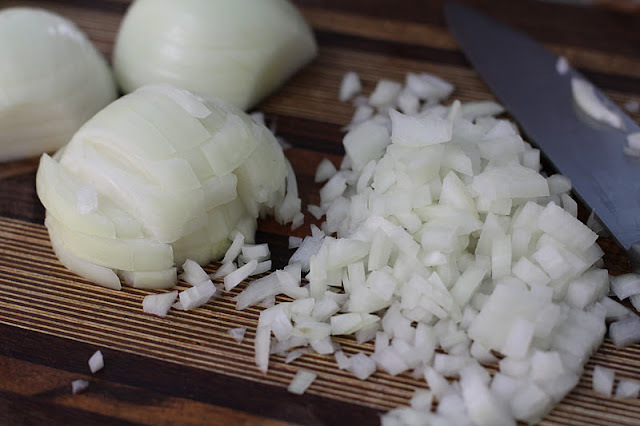 While the sausage is browning, begin cooking the onions. 3. In a large soup pot, heat the olive oil over medium heat. Add onions and sprinkle with a little sea salt and a few grinds of black pepper. Add the chili flakes, Italian seasoning and oregano. Stirring ocassionally, cook until the onions are translucent, about 10 minutes. Add the minced garlic, and cook, while stirring for 2 minutes. Add the sliced mushrooms to the onions. Sprinkle with a little sea salt and a few grinds of black pepper; stir. Continue cooking to release the mushrooms moisture. 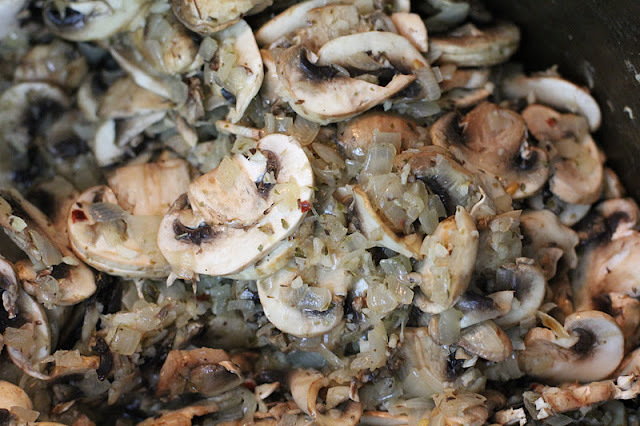 When the mushrooms are reduced and cooked, and liquid has mostly evaporated, add the cooked sausage. 4. Add the red wine to the hot skillet to deglaze. With the spatula, release the browned bits and let the red wine reduce for about two minutes. Scrape the syrupy bits into the soup pot with the sausage. 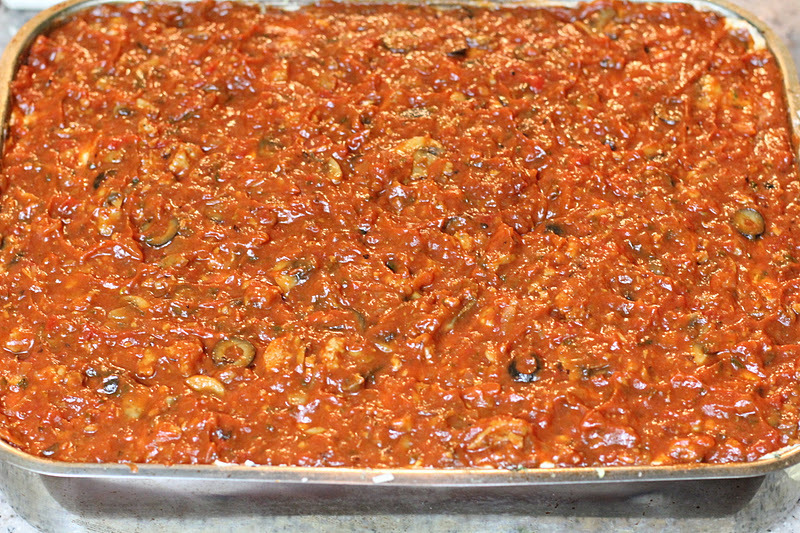 Add the tomato paste, and stir until well distributed. Add the tomato purée and crushed tomatoes; stir. 5. Add the roasted peppers and sliced black olives. Cook over medium to medium-low heat until the sauce is hot and bubbly, about an hour. Turn off heat. Add minced parsley; stir. Let cool. Cover and refrigerate overnight, or up to 24 hours. 6. 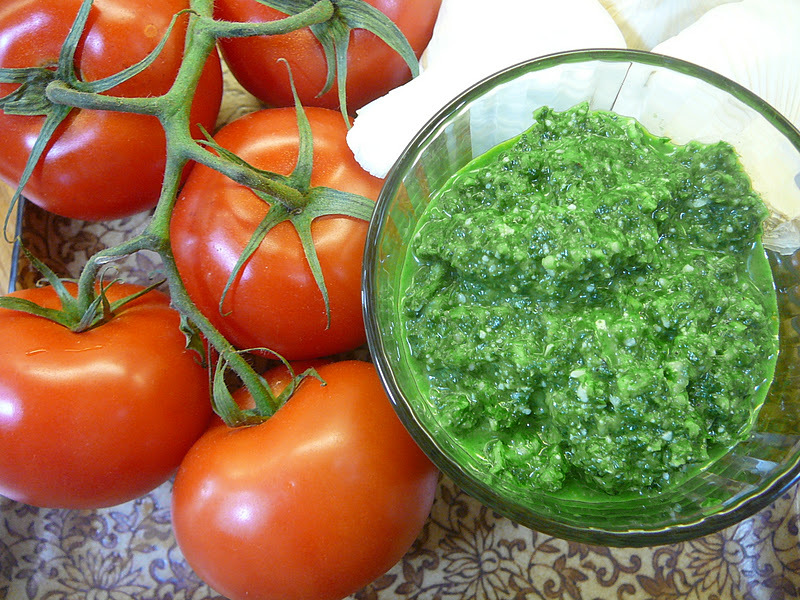 Make the basil pesto, and store up to 24 hours. 7. 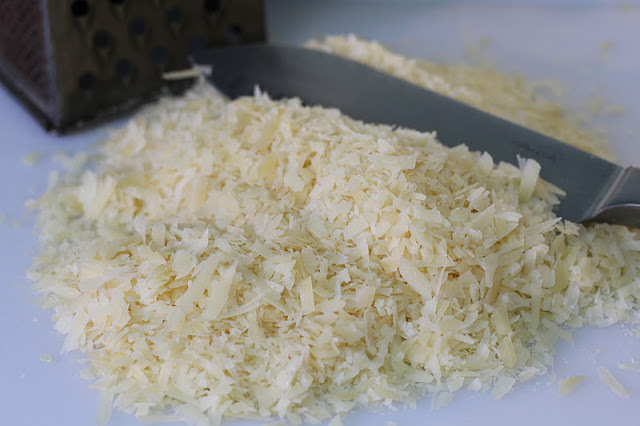 Shred the mozzarella and parmesan cheeses, and store separately. 8. The next day, in a large bowl, mix the ricotta cheese, the eggs and the pesto. A. Spray the pan well with non-stick spray. B. 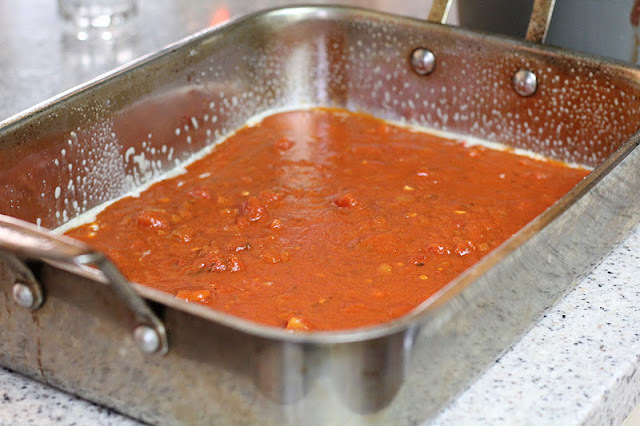 Evenly distribute one 25-ounce jar of marinara sauce on bottom of baking pan. 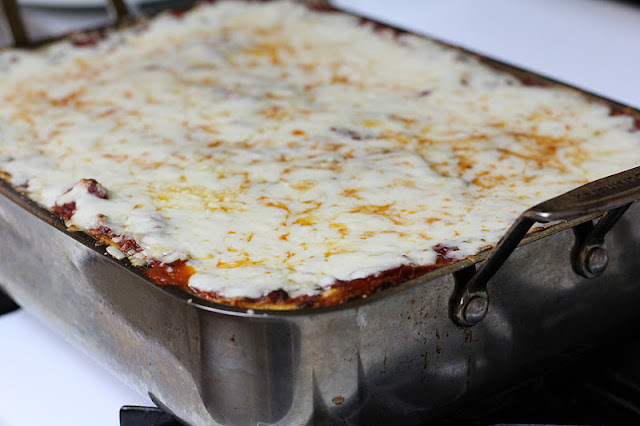 C. Layer uncooked lasagne noodles (slightly overlapping), thin layer of meat sauce smoothed with the bottom of a 1-cup measuring cup, ricotta mixture, thin layer of shredded parmesan, shredded mozzarella. D. Layer uncooked lasagne noodles, meat sauce, ricotta mixture, shredded cheeses. E. Layer uncooked lasagne noodles, meat sauce, ricotta mixture, shredded cheeses, meat sauce. 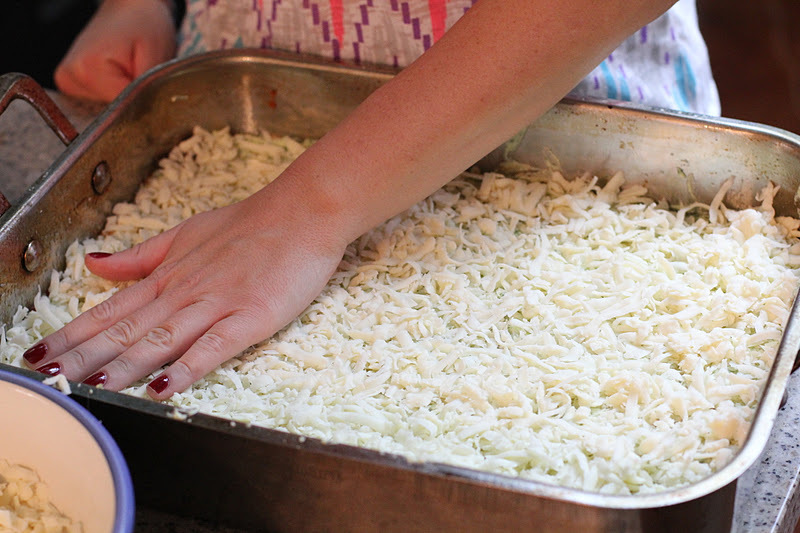 F. Postpone the final layer of cheese until 5 minutes before the lasagna is ready to come out of the oven. 10. 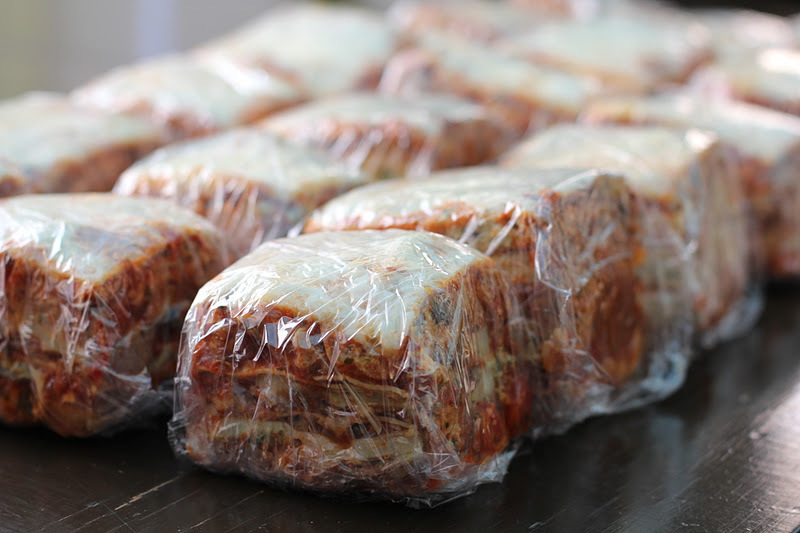 Refrigerate overnight (let sit at room temperature for 1 hour before baking), or bake immediately, covered with aluminum foil, in a preheated oven set at 400°F. Immediately reduce the heat to 375°F and bake for about 80 minutes until bubbly. Top with final layer of cheeses and bake uncovered until cheese is melted, about 10 minutes. Let stand 15 minutes before cutting. Notes: I prefer to cool the baked lasagna, and then refrigerate overnight. 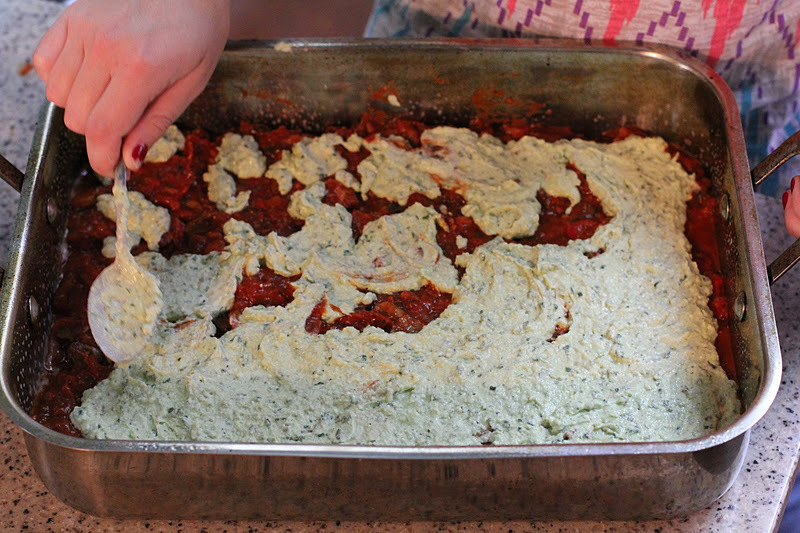 The next day, I cut the lasagna into individual portions. Each square is wrapped individually in plastic wrap. Place the wrapped pieces into gallon size Ziplock bags; freeze. To bake, unwrap as many servings as needed. 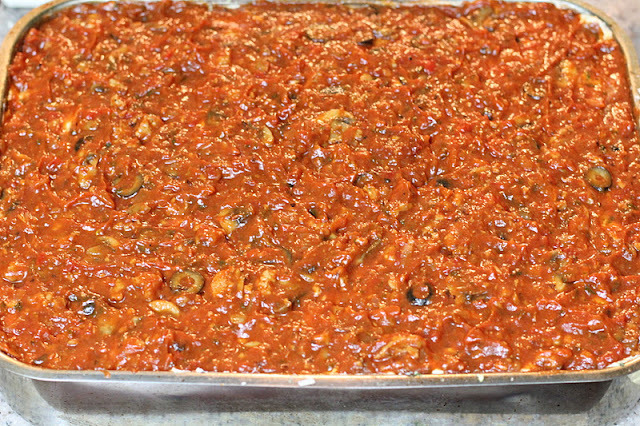 I put each serving into individual baking dishes that have been sprayed with oil and coated with a thin layer of marinara. Bake at 350°F until heated through and bubbly about an hour. 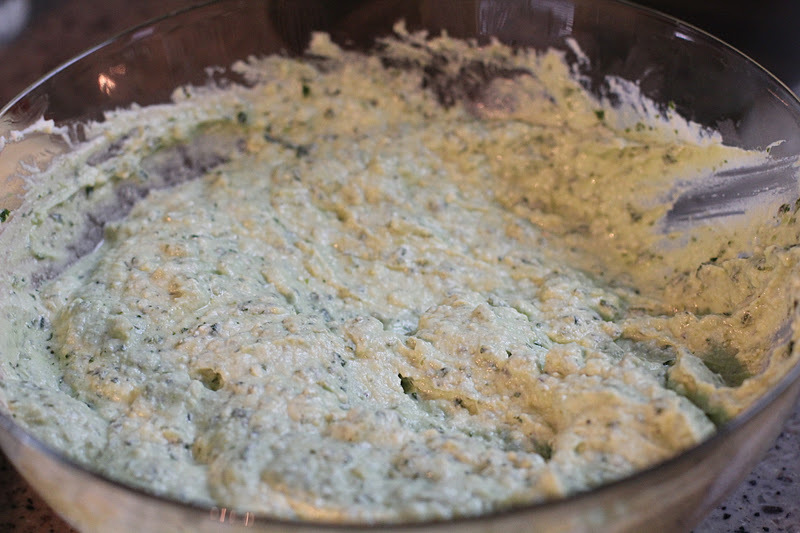 For faster baking times, partially defrost on the counter, or in the refrigerator overnight.